A VPN or Virtual Private Network is a mechanism that hides the original IP address of the users and replaces it with a different one. People across the world are using VPN on their domestic and corporate networks to keep them secure in the online world. Well, you must be interested in knowing how do VPNs work? In simple words, it connects your PC or mobile device to a virtual private network, making it intractable. It is a secure way to connect to the internet. The data sent over the connection remains encrypted. Therefore, it is secure. People are increasingly opting for VPN, as it delivers better levels of privacy online. What Can You Do With VPNs? With the rise in cyber threats over the last few months, more and more corporate firms are integrating VPN into their systems. Besides, using a virtual proxy network removes the restrictions on using the internet. For instance, you can unblock YouTube when you have Le VPN in your system, and download the videos. Recently, YouTube has increased the rates of its TV services by $5 a month. The users now have to pay $40 a month to enjoy the access to its channels. In case, you are traveling; you will not be able to get access to these channels due to geographic restrictions and limitations. It is necessary to get Le VPN’s VPN service and enjoy your freedom while surfing internet or browsing videos. Besides, using a VPN will keep your system protected against hackers. Individuals store their valuable data online. This confidential data is prone to online theft and misuse. A VPN hides your IP address, making your network intractable. Evidently, your information remains safe when you use a VPN. 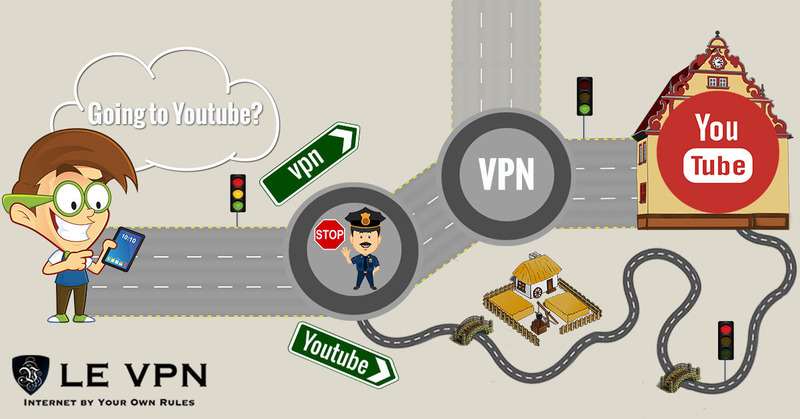 You should know how do VPNs work before you opt to integrate it into your system. This will enable you to decide when and where you need to use these networks. You will also get a comprehensive concept of the types of threats that a VPN can protect you from. When you get connected to a virtual proxy network, it replaces your IP address with the one that the VPN client provides. In case you are in a country that blocks YouTube; the proxy network will enable you to get connected to the website. The authorities will not be able to track your location while using the VPN. Evidently, you should have a good knowledge of how do VPNs work. And Le VPN is among the most reliable and trustworthy VPN provider in the market. With Le VPN, you can choose from as many as 114 countries to change your location. People across the world can get access to the restricted websites when they use Le VPN. The high standard VPN servers will help you to get across the websites reserved for other countries, as well. Get across to a reputed Le VPN to enjoy the maximum benefits. Additionally, Le VPN is very affordable. Grab the Le VPN Spring Special deal. Pay only $69.60 and get Le VPN’s services for 2-year.